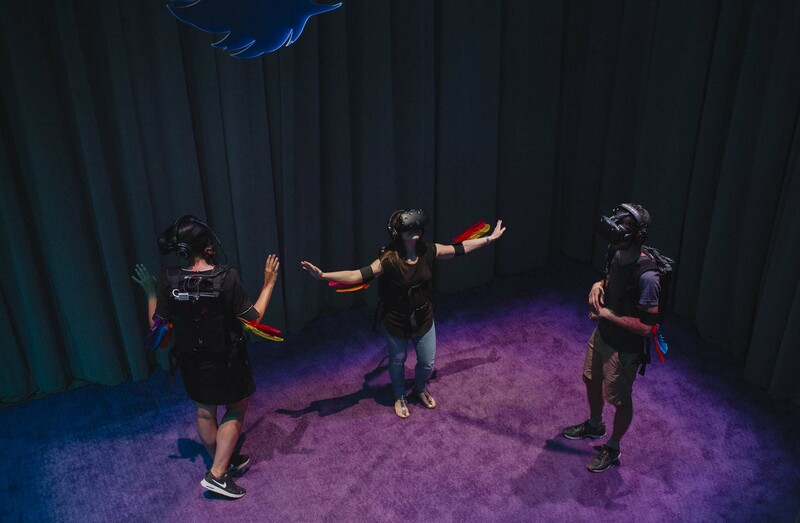 We spoke with David Lobser, the NYC-based artist, animator and “creative coder” behind Flock, a shared, location-based, social VR experience that allows participants to shed their human identities and live as birds. 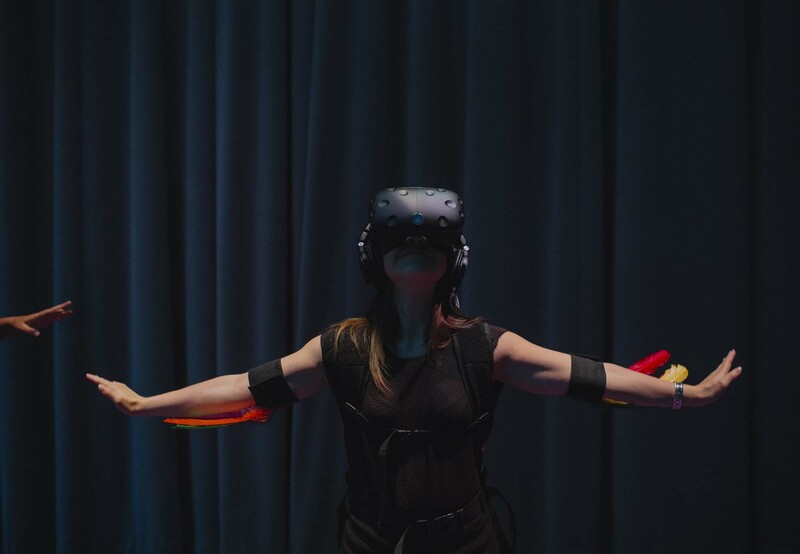 This multiperson VR experience is produced by Object Normal, with support from NYU/MRL, and is currently featured as part of Lucid Realities exhibition. You are actively involved in the setup of Flock, so is that how you delve into both the programming and the artistic process? By setting those parameters, you’re shaping the world in which the design has to live—but not necessarily the design itself. You define rules, and there can be an infinite number of things within a constrained area. All the insects within Flock were designed that way. Basically, it was all about designing a system. Then I was able to go in, randomly generate all the insects, and choose the best ones. What was your artistic goal with this piece? What were you looking to create? It was definitely an evolutionary process! Initially, Ken [Perlin, Holojam inventor] and I had been talking about different ways to experience projects that bring multiple people into the same space at the same time. Initially, we had people wear headsets, and we tracked their arms and legs so you could see their entire bodies. Then we tried to figure out how we could get a lot of people into the same place at the same time. We realized it was doable, but only if we didn’t track their arms and legs. What Ken wanted to do was ‘theatre,’ which is harder to do than something like a ‘sandbox.’ I’ve been working more in the realm of sandboxes for a lot of reasons, but mainly because there are fewer barriers involved. A ‘sandbox’ is a space you can go into, and there’s some simple thing you can do that encourages people to interact with each other. ‘Theatre’ is different in the sense that you need to build more assets and characters. Things have to happen, there’s an arc, and more work goes into building it. With a sandbox, it’s more like, ‘here’s a bunch of stuff,’ and you just see what people do with it. One of the experimental parts of Flock has been seeing what people actually do when they’re in the space together. I designed the experience with the idea of getting people to move around the space as much as possible. My initial thought was, ‘OK, if we have 30 people and we want to do something simple that’s going to get people to move around, what’s going to be interesting about the outcome of that interaction?’ The whole concept of flocking was really interesting too, in terms of the computer graphics. In the mid-nineties, Craig Reynolds came up with a way to make virtual objects flock together. Flocking works around a simple node, essentially an object in a space that can see other objects. It knows which way it’s going and it can see nearby objects. But those objects are basically dumb agents. You give them a few rules, such as alignment, cohesion and separation. What that means is, these objects want to get closer to one another—that’s cohesion—but they don’t want to merge into each other—that’s separation—and they also want to be moving in the same direction, which is alignment. If you take these simple rules, you don’t need anything to control all these entities. The flocking behaviour emerges from each one having its own set of rules. We’ve been trying to see whether that behaviour would arise from just getting people to move around in a space, and the answer so far is no. What do people tend to do instead? One thing I have found surprising is to what extent people get into acting like birds. We put feathers on people, then they go around and eat these bugs. The bugs are arranged in a certain way, and their behaviour is set up so that people are encouraged to peck at them. If they walk right up to the bugs, the bugs move away, so they need to get close and then jab their heads in toward the bugs. The whole thing has turned into much more of a person-to-person interaction too. Group dynamics are important, because individuals express themselves in their own way and groups wind up expressing different things. Groups of kids will act differently to groups of drunk people, though they do share some similarities! Some people are shyer and they might take longer to warm up, but then they get really into it and start running around Some people are very competitive about eating as many bugs as they possibly can, while some are fascinated by other people, and others get really into performing with the feathers on. When they put the feathers on, people really get into the flapping. It’s fun to have that freedom of exploring another identity. There’s something about being in VR that’s like going to a costume party. Because everyone else is in costume, people become less inhibited. You see people waiting in line to try it, and they think it’s going to be boring. They don’t know what’s going to happen, then they get in there and it just blows their mind. When they’re in the space, people become performers. Even if you’re not in the VR space, it’s fun to watch people do it. Flock is part of the Lucid Realities exhibition, on view until December 16 at the Phi Centre.